DST provides a safe, professional and reliable passenger transport experience and excellent alternative to public transport around the French and Italian Riviera. Our door to destination service all year round takes the hassle out of getting where you need to go - at a rate that is considerably more economical than a taxi or limo service. Easy & ﻿Comfo﻿rtable: No waiting or queueing. DST provides a stress-free service and a reliable alternative to pubic transport with its risks of strikes and delays. Competitively Priced: DST passenger transport service is competitively priced to reduce your business or personal travel costs. N﻿o Hidde﻿n Charges: Our rates are fixed in advanced no matter the time of day, luggage count, weather conditions, or time spent in traffic. Pre-Payment Option: Since many of our clients prefer to use credit cards for travel expenses, we offer an online advanced booking and pre-payment option. 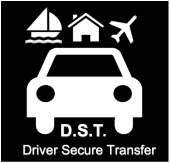 ﻿Qualifie﻿﻿d Drive﻿rs: DST drivers hold the French VTC Professional Driver card, speak English, and have extensive driving experience on the Riviera. Driver Secure Transfer holds the EVTC Passenger Transport Licence and the VTC Professional Driver card delivered by the Préfecture des Alpes Maritimes as a requirement to transport passengers. *Always be wary on the Riviera of unauthorised drivers without the requisite government authorisation. ﻿✔﻿ Special insurance with MFA ensuring cover for our clients during transportation. ✔﻿﻿ Private chauffeur professional liability insurance contracted with Arca Transport. Copyright © 2014 Driver Secure Transfer.All Rights Reserved. Copyright © 2014 Driver Secure Transfer.Tous droits réservés.